Announcement Welcome to All Wired Up Jewelry Designs selections of stylish artisan fine gold and sterling jewelry. Last day to order for guaranteed Christmas delivery is December 18 for made to order items. I create fine quality jewelry with elegance for both bridal and every day wear using sustainably made metals, ethically sourced colored gemstones and conflict free diamonds. I take great pride in using quality materials and gemstones for your jewelry and strive for the best in customer service. *My Bespoke Bridal Jewelry consists of hand fabricated fine heirloom quality engagement and wedding bands in gold and sterling along with earrings, pendants and bracelets suitable for brides or bridesmaids. Ethical diamonds and moissanite as well as colored gemstones are offered. *My Wear Daily line offers a wide selection of custom made to order stacking rings and bands, birthstone or family jewelry, earrings, hoops, necklaces, cuffs and bangles suitable for career wear and evenings out. *My One of a Kind designer jewelry displays my more whimsical side with sterling bohemian style adornments, unique stone statement pendants, earrings, cuffs and rings. All stones are cut in the USA. What you can expect: My motto is, simplicity is the ultimate statement. My jewelry is primarily classic and made to last for generations. I make each piece by hand just for you from raw materials, I do not cast in volume or stock multiples from a distributor. Descriptions include details of quality, width and thickness of the materials used and sizes and carat of gemstones where appropriate. Lab created and any treated gemstones are declared clearly if used. I want you to know exactly what you are getting, no guessing about what you are buying from just looking at a picture. You will find I offer a variety to meet all needs and budgets. I respond to all inquiries normally with a few hours. I welcome requests for custom jewelry and variations of items in stock. I have some sample items in stock in various sizes, if you are very unsure of your purchase, contact me to see if I have something available for you to "try on", once made to order, all policies apply. Earrings are excluded sample items. I strive for a balance of timeless classics, modern and versatile, made with precision quality and attention to detail. Each piece I make is created in my home studio, all karat gold and sterling is solid, not hollow, not plated or filled. All fabrication is done by hand with time honored metalsmithing techniques with hammer, torch and anvil. A few pieces are now available from my hand carved wax models using the lost wax casting method. Your jewelry is personal and important to me to make perfectly for you, edges are smoothed, joins are perfectly matched and the inside of settings are polished before I set the stones. I do not take shortcuts, every piece is finished properly and described honestly. I want you to be thrilled with your purchase so Please feel free to ask questions. For those of you who find the perfect item, but you're going to miss that "need by" date or have no idea of the size- consider using my "Gift Message" card option. Ask at purchase and I will send you or your recipient the gift message card with a ring sizer, bangle/cuff sizing or other instructions with my business card enclosed. If it's a real last minute rush- I can also send the card and a photo attachment by email and mail additional information later. No pressure shopping! All jewelry is made using 100% recycled silver and gold from an eco-conscious company and gemstones are purchased from a certified colored stone supplier. Beads, cabochons, findings out of production jewelry and beautiful pearls! All images and designs are the intellectual property of Ppennee of All Wired Up Jewelry Designs. All rights reserved. Welcome to All Wired Up Jewelry Designs selections of stylish artisan fine gold and sterling jewelry. A customer wanted milestone charms to celebrate her weight loss journey, perfect for the add a charm bangle! This is where it all happens, my little bench and my favorite toy- my microscope for stone setting! Daughter and #1 Granddaughter - why do they grow up so fast? #2 Granddaughter Ally - growing like a weed and still cute as ever! All Wired Up Jewelry Designs/Ppennee offers a large range of bridal, custom and everyday jewelry. I strive to create exceptional products, many of which are customized just for you. My motto is, simplicity is the ultimate statement. Every item is made by hand in my home studio! My jewelry is primarily classic and made with attention to details to last for generations. I try to offer a range of items that reflect my love of stones and my love of fine classic jewelry. You will find handmade one of a kind jewelry as well as custom made to order engagement and wedding rings and every day earrings, stack rings, bangles and cuffs in my shop. All Wired Up Jewelry Designs was founded in 2008 as an artisan jewelry company. My specialty is classic and everyday wear jewelry. My focus is creating beautiful handmade eco-friendly 14k Gold wedding and engagement rings made for todays modern couples. My goal is to create exceptional products, many of which are customized just for you and to make what you want, how you want it so you love your selection. I do my very best to provide exemplary customer support and assistance both before and after the order is fulfilled and whenever necessary. I love the challenge of making jewelry that is beautiful, durable, and comfortable to wear. A simple yet significant luxury in one’s wardrobe, jewelry is meant to be worn and celebrated, not be tucked away in a box. Each of my designs is made with the intention of making you smile daily in life while embodying heirloom quality that can be cherished and passed down for generations to come. Jewelry is personal for you- and it is to me when I make it for you. If you are reading this as a new customer or a repeat customer just taking time to get to know me a bit better, be assured that each piece I create is done by my hands in my home studio. I purchase 100% recycled materials to create my jewelry and all my gemstones are ethically sourced. All stones are set by my hands, so no two pieces will ever be exactly alike. For my, everyday wear lines, I do use some pattern wire with florals and scrolls, all other textured jewelry is done with tools in my shop and some "found" material I think will look great embossed in metal. I have started to learn wax carving and am adding some cast items to my shop. I proudly sell only gemstones from a certified colored stone distributer, all diamonds are from Kimberly certified suppliers and rubies are also from a certified supplier. All my colored stones are rated A-AAA for clarity and color, I do not use "commercial quality" unless my listing does not state a rating. The only treatments on my stones are heat or irradiation, both GIA approved for colored stones, no dyed or glass filled stones. I'm Pennee, the one and only staff for my jewelry making business. I make each piece of jewelry by hand from recycled sterling and gold. I am the selector of stones, secretary, photographer and shipping clerk- just me, and I enjoy every minute of it! Welcome to All Wired Up Jewelry Designs. I create a selection of artisan crafted sterling and karat gold fine jewelry with classic style and a little edge. I design my jewelry so it is fun to wear but it's also made to last and cherish. I am happy to assist you to select hand made jewelry and answer all your questions. I want you to be thrilled with your purchase, feel satisfied that you received high quality pieces, and know that you own one-of-a-kind hand crafted jewelry. I have worked as a bench jeweler for 10 years with primary interest in fabrication and stone setting. My jewelry is either hand fabricated from raw materials or cast from my hand carved waxes. The plus for this is you get exactly what you want, made to your specifications after you order it. The other side is I have a limited selection of items ready to ship next day since most is custom made to your specifications after you order. 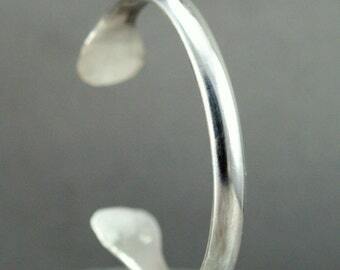 I am an eco-conscious shop and use 100% recycled material for all my silver and gold creations. All natural gemstones are from vendors that supply only ethically sourced diamonds and colored gemstones. I supply only the highest quality lab created stones available. All cabochon stones are cut here in the US. Please be sure to read my policies on returns and exchanges before ordering made to order and requesting custom items. Custom made to order jewelry you request is made after you purchase. I am very responsive to all contacts and I stand behind my workmanship 100%. I have tried to make my policies as clear and thorough as possible. If you have questions, please ask before ordering. I want you to be thrilled with your purchase. I am a one person shop, no helpers or assistants. I am the person making your jewelry by hand, responding to your questions and shipping your order. I make each piece one at a time from raw materials. I have a few items cast by a local jeweler with a private studio for my hand carved waxes. I do try my best to make items as quickly as possible and meet your shipping deadlines. My business is strictly on line so production is not slowed making for shows, wholesale accounts or galleries - my focus is making just for my customers and making it exactly the way you want it. I, Pennee Parker, am the data-controller of your personal information as it relates to my shop Ppennee aka All Wired Up Jewelry Designs. You have the right to know what personal data I hold about you, and to ask for that data to be changed or deleted. You also have the right to complain to the appropriate authority in your country if you believe there is a problem with the way I handle your data.